Rainfall-induced landslides are major natural hazards that are inherently inter-disciplinary crossing various fields (from geology to hydrology) and scales (particle level to catchment scale and beyond). 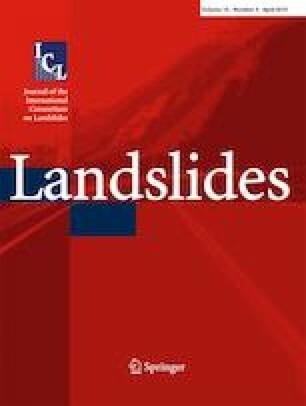 Comparatively, very few studies on landslides have been conducted at the particle level with most research focusing on particle breakage or the effect of particle size and shape on the macro-scale and particle contact behavior. Limited evidence suggests that soils under shear undergo changes not only of size but also of shape and surface roughness. However, the particle morphology descriptors used are frequently qualitative so that information on how the soil particles are damaged during landsliding remains incomplete. This paper uses quantitative particle morphology descriptors, namely particle size, shape, and particle surface roughness to investigate particle damage during landslide-induced shearing. A series of ring shear tests were conducted to simulate landslide movement in completely decomposed volcanic rocks (CDV), a typical soil in Hong Kong that was retrieved from a debris flow. Particle size, shape, and surface roughness were analyzed on original CDV particles and on samples subjected to ring shear testing. Owing to the crushable nature of the soil, particle breakage was the key factor controlling particle morphology, with the results revealing an intricate dependency of shape and surface roughness on particle size. Shearing enhanced the bimodal gradation of the soil, with the larger grains more rounded and smoother and the resulting fines with a more irregular shape. This may be attributed to a combination of chipping and abrasion of the coarser particles. Further research is needed to ascertain the effect of such particle morphology changes to landslide movement. The authors are very grateful to Professor Wei Hu for facilitating the use of the ring shear apparatus in his laboratory. We also acknowledge the Head of the Geotechnical Engineering Office and the Director of the Civil Engineering and Development, the Government of the Hong Kong Special Administrative Region, for the permission to publish the photograph in Fig. 1. This study received financial support provided by the General Research Fund, Research Grants Council, Hong Kong (17200114, T22-603/15-N), and by the State Key Laboratory of Geo-hazard Prevention and Geo-environmental Protection of the University of Technology, Chengdu.